Spaghetti alla carbonara is traditionally made with spaghetti; diced, cured meat such as prosciutto, ham or bacon; and an egg- and olive oil-based sauce with herbs and grated Parmesan and/or Romano cheese. 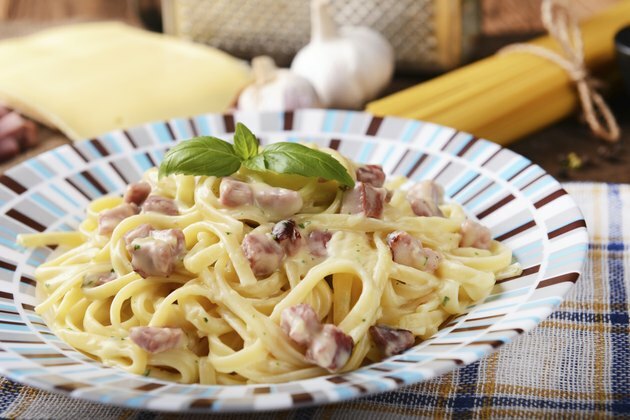 The delicate nature of cooking spaghetti alla carbonara rests in the last minute combining of ingredients, so the best way to enjoy it is when it is freshly made, but spaghetti alla carbonara can be stored in the refrigerator for later enjoyment. Reheat spaghetti alla carbonara in the microwave or on top of the stove. Allow the spaghetti alla carbonara to cool, covered, at room temperature for 30 minutes after cooking. If the carbonara is still steaming, angle the cover so the carbonara is slightly uncovered for 10 to 15 minutes to let the steam escape. Transfer the spaghetti alla carbonara to a tightly sealed food storage container or plastic bag. Fill the container as much as possible to avoid excess air. Squeeze any excess air out of the plastic bag before sealing it. Store the sealed spaghetti alla carbonara in the refrigerator for up to four days. Preheat a skillet with 2 tsp. of olive oil over medium heat, or put about two cups of spaghetti alla carbonara in a microwave-safe bowl and cover loosely with wax paper to prevent spattering. Reheat the spaghetti alla carbonara in the skillet while tossing it for about five minutes, or cook it longer to make the spaghetti crispy. Alternatively, reheat leftover spaghetti alla carbonara in the microwave on high for about two minutes. Drizzle olive oil over the spaghetti alla carbonara if it appears dry. Sprinkle grated cheese over the reheated spaghetti alla carbonara and enjoy. Spaghetti alla carbonara can be frozen but it will lose quality, as the spaghetti will become mushy and the egg-based sauce will not freeze well.